Recently with the sudden closure of Jmanga, readers like myself is left with the same issues that was prevalent prior to JManga's existence. Being a manga reader in any country outside of Japan is never going to be easy and is a battle to be able to read content legally without relying on scanalation. The challenge of navigating various publishers' websites to see which Japanese manga was licensed and ultimately own or read it. With JManga existence there was promise on the horizon that readers can have a gateway to legally read or own multiple types of manga. But with JManga's their personal expectations may have fallen short. In short, this is an ongoing race for companies to see a successful business model to satisfy oversea consumers. 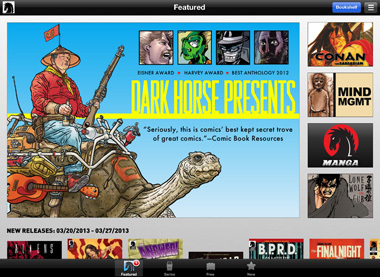 Dark Horse is the third largest US publisher dealing in comic books. 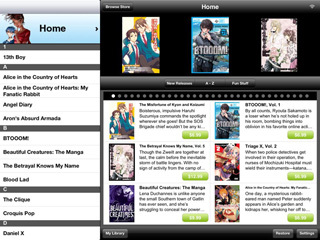 It has an app that is available on Android, Apple, Kindle and Nook to sell digital copies of their manga. An average title is sold at $5.99. Consumers are purchasing a license to view a book that is kept in a cloud, so a consumer with a Dark Horse Digital Account buys a title at a time to read across multiple devices. Dark Horse licenses 100+ Japanese manga like Blood+, Neon Genesis Evangelion, Kurosagi Corpse Delivery Services, Astro Boy and Blade of the Immortal. Many of these titles are action or mystery prevalent, but there are selected titles that like Bride of the Water Gods that is female targeted. This is a company that sells to a generally masculine demographic. 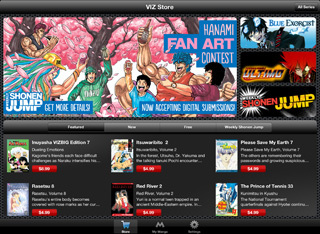 Digital Manga has built a large fan base surrounding boys love graphic novel titles. They licensed over 400 titles, with new content updated daily targeted mainly toward adults. Average price for titles is priced from $7.95 to $13.95. Consumers can purchase formats that are suitable for the reading device that they own, with an additional cost to license for more than one reader, or purchase a downloadable PDF that is watermarked for individual reading. They sell print as well as digital, with reading capability on the Android, Apple, Kindle, Nook, Kobo, and Sony. Digital Manga sells on their website to a registered email. Initially Digital Manga was selling books on a point purchased system like JManga, but has switched to a cash system. They had also previously had a rental system, but that was an idea that didn't work, so Digital Manga dropped it. Kodansha is the largest Japanese publishing company, and this is their U.S. subsidiary. 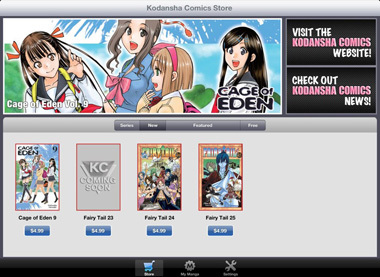 Titles like Fairy Tail, Arisa and Sayonara Zetsubo-sensei is only available on the Apple market within their app, as Kodansha focus more on selling print. Titles are priced at $4.99. At this time they're only electronically selling seven of their 40+ licensed series. This is a mixed situation with fans, since Kodansha has more titles to share like Sailor Moon, Ghost in the Shell or Negima. 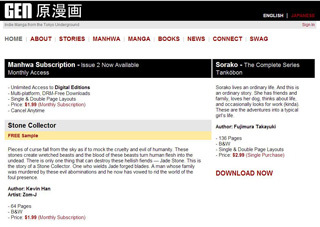 Only time would tell as to what Kodansha would be doing with their titles and the e-market. Their titles appeal to both genders, and are a teenager targeted demographic. Netcomics licenses mostly manhwa and some manga content of which they digitally sell on the computer to be viewed chapter by chapter, typically around $0.25 for 48 hours to be read. 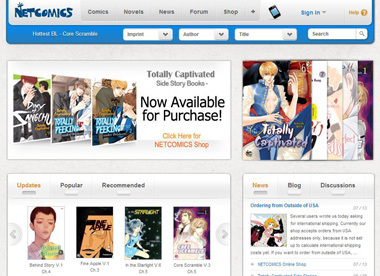 Readers would have to register with the company and then purchase an e-currency that Netcomics provides to read manga on their manga viewer which is server based. Most of their titles they have are targeted for a female demographic. Anyone can preview the first chapters for free, and this is a way to enjoy reading Korean manhwa legally. NTT Solmare is a Japanese mobile company based in Osaka. 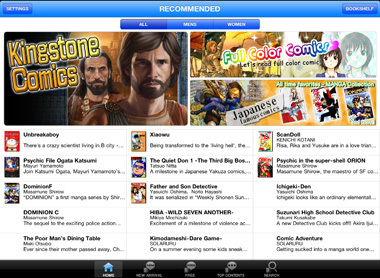 They sell manga via the ZQ Books app on Apple. Prices are averaged at $5.99 for a volume. Content is cloud based, and they have titles like Salaryman Kintaro, and other Japanese manga. In terms of content, this seller has a selection very much like JManga in terms of variety. The demographics targeted by NTT Solmare is teen to adults of both genders. Viz Media is a company that is one of the oldest and manga licensing services in the United States. 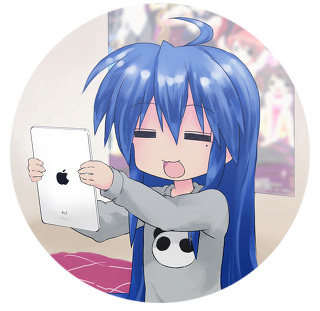 It is own by the Japanese publishing company of Shuiesha, and has 100+ Japanese manga available to be purchased for apps that the company has for Kindle Fire, Apple, and Google readers. Purchases are stored within a cloud, and can be read between these apps. At this time readers can purchase titles within the app or online. Books that are rated Mature are purchased on the website. A single volume of a title is priced at a range of $4.99 to $8.99 or more. Readers can also subscribe to Viz's Shonen Jump Magazine which is released on a weekly basic to release chapters for 11 titles that include One Piece, Naruto and Toriko that Viz licenses to simultaneously run the same time of publication as it would for their Japanese counterparts. Readers can subscribe for a year at $25.99 for 48 digital issues a year. Yen Press is a company that licenses a broad range of titles ranging from manhwa to manga, and there are also manga adaptations of American author's books themselves. They sell print, and have a digital content available for Apple products. Purchases made are stored within a cloud, and is priced at $6.99 to $12.99. Yen has a monthly digital manga known as Yen+ priced at $2.99 a month for about nine of their current running titles including Soul Eater, and Maximum Ride. This is available to be read on the computer. When a person starts a subscription they start from the current and the previous issue. Gen Manga is a company that specializes in licensing and publishing indie (doujinshi) titles that are not published by the bigger manga companies like Kodansha or Shuiesha. It has also started to head in the manhwa direction. Gen Manga licenses about 10+ titles. Readers can choose to subscribe to Gen for $1.99 a month or wait until various stories are completed and compiled in a separate digital edition. Titles like Wolf or VS Aliens can be purchased either for Kindle or Apple products. Subscribers of Gen are able to download digital editions of what Gen has to offer. 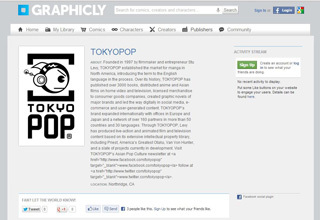 Tokyopop is a company that had to sell its subsidiaries after Borders closed. They lost a lot of the Japanese manga that they had licensed in the early 2000's, but is still in the works of working with other companies to remain a brand for their OEL graphic novels. For the ebook content that they have, they are working with Graphic.ly to distribute Psy-Comm and Bizenghast for reading on the Kindle, Nook, Apple, Google and Kobo reading tablets or phones. These are priced at $5.99 a volume. The targeted age group for these books is for teenagers of both genders.